When Older People Walk Now, They Stay Independent Later : Shots - Health News Nobody wants to spend their final years unable to walk, but that sad fate afflicts many people as they age. A little exercise helps a lot, especially if people can do it in social groups. Walking: so simple, yet difficult for many people as they age. Millions of older people have trouble walking a quarter of a mile, which puts them at high risk of losing their mobility, being hospitalized or dying. But it's hard to get people who are already sedentary to become more active and stay that way. In an attempt to solve that problem, researchers got people in their 70s and 80s to walk and do simple exercises in social groups. The people who did that were less likely to become disabled than those who attended classes on successful aging, according to a report published Monday in JAMA, the journal of the American Medical Association. The people in the study had to be able to walk one-quarter of a mile in 15 minutes, using no aid beyond a cane. 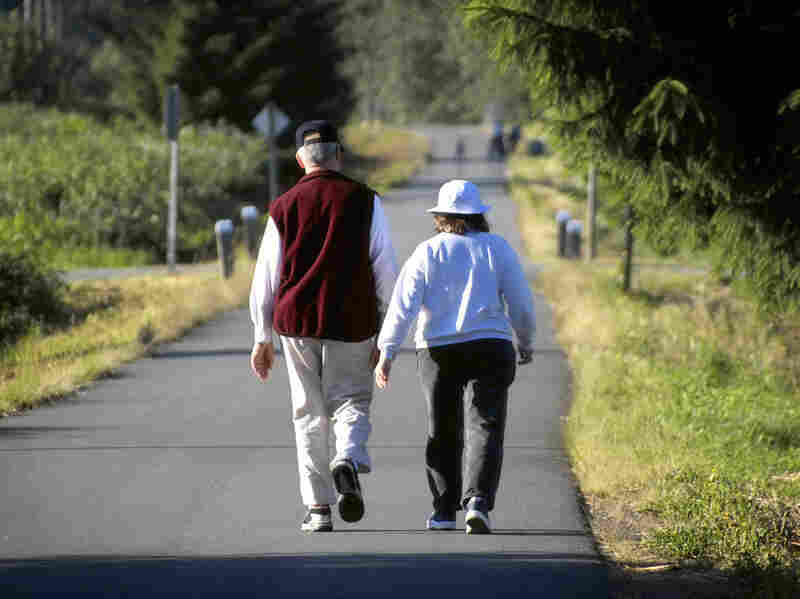 But 24 million Americans have trouble walking that far, according to Dr. Marco Pahor, director of the Institute on Aging at the University of Florida, who led the study. And 13 million can't walk a quarter-mile at all. "If people can or can't walk, it makes a huge influence in their daily lives," Pahor told Shots. The goal here was not just to do an exercise study, he adds, but "really to modify their lifestyle." The people in this study, who lived in eight different states, said they were active less than 20 minutes a week at the beginning of the experiment, and were considered at high risk of becoming disabled based on their lack of leg strength. Those in the physical activity group met twice a week to walk and do simple leg-strengthening exercises with ankle weights, and were asked to walk and do exercises at home, too. The goal was to work up to 150 minutes a week of activity. Both the activity group and the people who took a class participated for 2.6 years, on average. At the end, 30 percent of the 818 people in the physical activity group had been temporarily disabled at some point, compared to 35.5 percent of the 817 people in the education group. And 15 percent ended up permanently disabled, compared to 20 percent of the sedentary group. A 5 percent difference doesn't sound like much, but Pahor says it matters, given how important it is to stay mobile and independent. "This is a very simple intervention; it doesn't require any equipment, any machinery." People could easily do this at home, but the social group was key to keeping them moving, Pahor says. "I think the biggest problem we're facing is that the simple knowledge of benefits doesn't change people's lifestyle." He hopes that health insurers will start providing these sorts of groups for older clients. Though the more active group fared better on mobility, they also were more likely to end up in the hospital. It's not clear why that was, but Pahor says it may be because they had more contact with the group leaders, and thus were more likely to tell someone if they had a health problem. Though this study was a large multicenter trial, it's hardly the last word on the topic. Pahor says he and his colleagues plan to follow their participants for another five years to see how they fare.